Between traveling and coordinating schedules, our Pro-Follows have slowed down a little so I’m glad to finally be back on a job site with Joe Bianco. We’re kicking off another Pro-Follow series, and this basement should look familiar because it’s Fred and Kim’s basement. 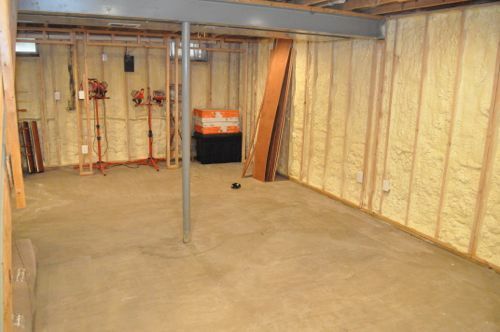 This is where we produced our spray foam insulation video and several other articles. You may be thinking that we’ve already covered a lot of basement projects and this Pro-Follow won’t offer anything new. Well think again because some of the exciting aspects of this remodel include flashing an existing deck, mold detection/ remediation and a comprehensive guide for installing a heated floor. 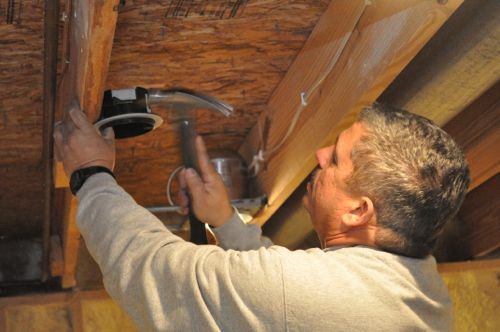 If you’re new to our Pro-Follows, Joe is a professional contractor and president of SDG Home Solutions. I shadow Joe on actual job sites, and there’s no better way to learn about home improvement than straight from an experienced contractor. I’d encourage you to check out some of the other work Joe has completed (basement remodel, kitchen remodel, bathroom remodel). If learning from the pros sounds interesting to you, subscribe to our email or RSS feed and never miss an update. As you can see, most of the framing has been completed, and the electric has been run. 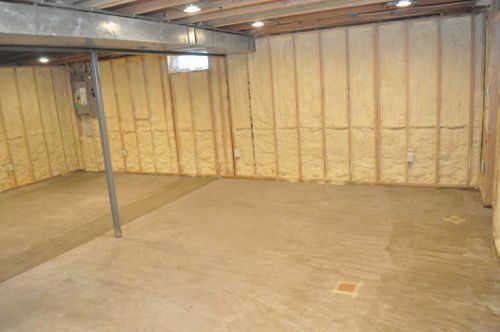 Just about the entire basement is insulated with closed-cell foam, and I think it’s worth mentioning that closed-cell foam is an excellent insulation option, albeit more expensive than traditional fiberglass batts. 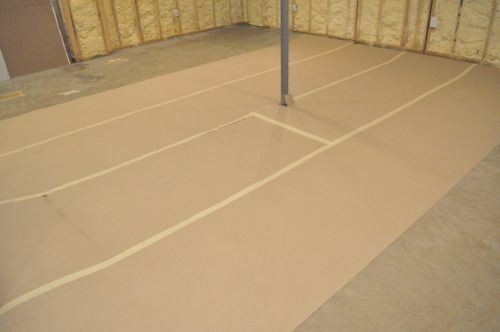 This closed-cell foam provides an R-value of 7.5 per inch, and forms a complete vapor barrier. Fred installed over 1,000 sq. 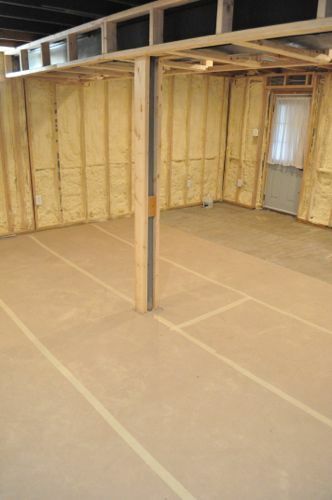 ft. of electric radiant heat and embedded the wires in self-leveling mortar (SLM) throughout the entire basement. 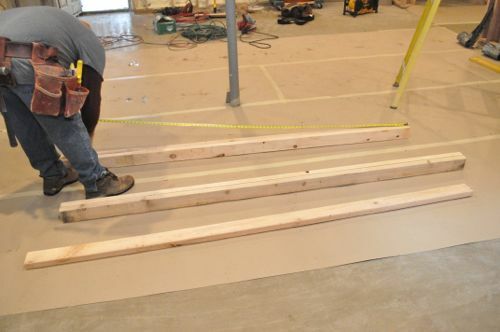 Look for a comprehensive guide detailing the entire process of installing radiant heat flooring including laying tile to come out of this Pro-Follow. Most of the electric work was already finished. However, there were a few minor changes and additions that needed to take place, and Joe brought in Russel from ETC Electric to tackle the short list. Russel added some boxes and switches for track lighting. He also took care of odds-n-ends like junctioning these wires in a box, and making sure everything else was tidy and up to code. There wasn’t much plumbing work required since the finished basement won’t include a bathroom or any other plumbing fixtures. Joe brought in a plumber from Drain Relief to relocate a few valves, replaces some hose bibs and run a new line for the refrigerator water supply. The framers didn’t have too much rough framing to complete either. Joe had them frame around a bulkhead, frame in support poles, ensure drywall nailers in all the corners and frame around some plumbing. They started by putting down a temporary floor protection called Ram Board to better protect the floors (and heating element). Here’s a few shots of the guys framing the bulkheads. A few of the floor joists had a serious crown, and the previous owners (or a contractor they hired) “fixed” that by simply cutting the joists. If you’re at all familiar with framing, you know that’s not an acceptable solution. 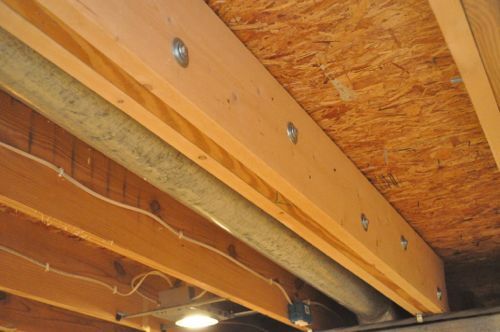 To remedy that, these joists have a 2 x 10 through-bolted to them. 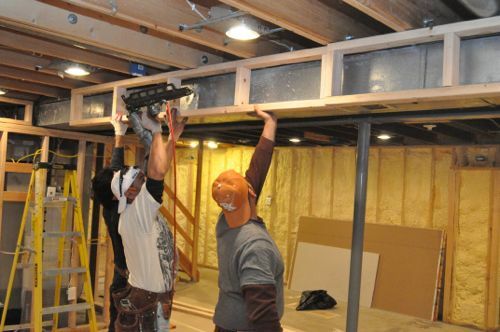 Unfortunately, they are not all even so the framers planed the floor joists as necessary for drywall. Some of the work still to come includes blocking up three small windows. The contractor who built Fred and Kim’s deck did not properly flash the ledger board. 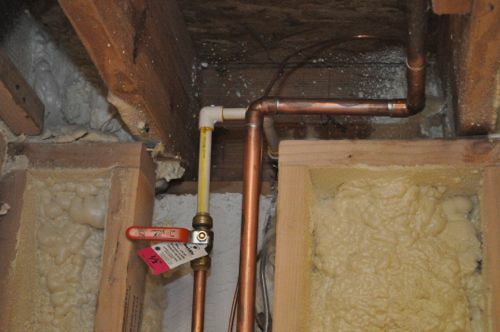 This is something Fred and Kim discovered when they found water leaking into their basement! Fred used silicone as a temporary solution, and now Joe will be flashing the existing deck to make sure it never leaks again. Look for a detailed how-to after that work takes place. 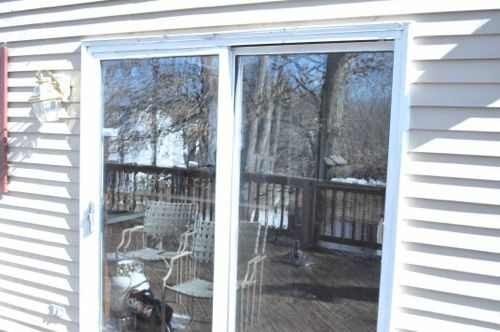 Joe will also be replacing this sliding glass door. That’s it for this update. Next time, you’ll get a look at mold detection, and it was fascinating! I hope you’ll stick with me. I suppose that deck is out of warranty now? What living elements are planned for the basement? i.e. movie theatre, playroom? I’m wondering the same about the planned usage for the basement. Also, is the use changing (thus the need for the revamp) or are things just getting old and need to be replaced? Yeah. The deck has been there about 5 years (I’d estimate), and even if it was newer, I don’t think Fred & Kim would get too far with the contractor. Looks like a great start! Oh how I wish this was the transformation taking place in my basement. Looks like a clean slate for future development. Can’t wait to see what’s next. 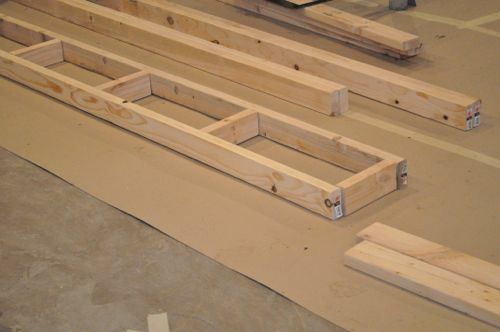 What size wood did you use for the bulkhead frame? Two by fours? They used 2 x 4’s. In the closet it’s a little tight so they ripped a few in half. Pretty sure I was experiencing intermediate Pro-Follow withdrawal symptoms. Glad you’re back in action. 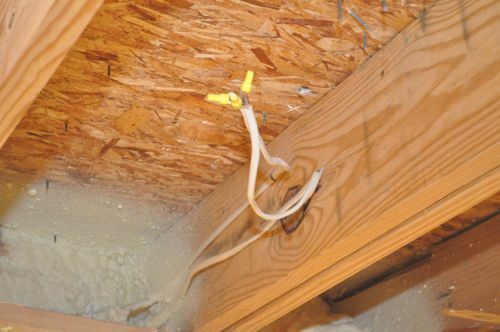 Was spray foam not applied on the ceiling because they knew they’d be finishing it at some point? 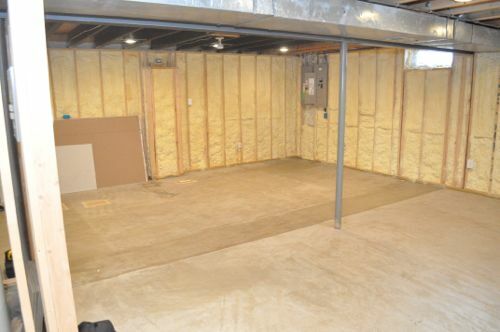 The unfinished section of my basement is insulated on top to keep the kitchen (directly above it) insulated. Smart foresight if that’s true since the spray foam was a while ago, right? This project has been ongoing for years now, but they knew they’d be finishing the basement eventually. Before the foam, the basement lost a lot of heat, and it really affected the rest of the house. 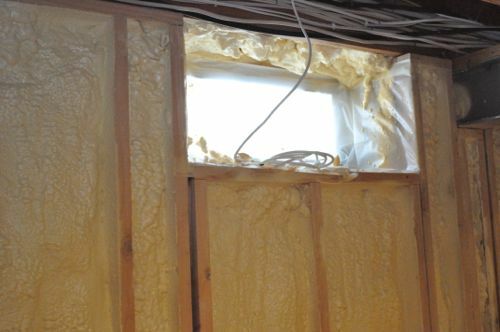 It was a huge improvement to get the walls insulated. Can’t wait to hear more on the radiant floor install! And since Jacque’s talked about replacing our sliding glass door, I’ll keep an eye out for the Pro-Follow on that! Thanks Ethan! Awesome. I can’t wait to do this to my own home. I’m most looking forward to the deck flashing post. 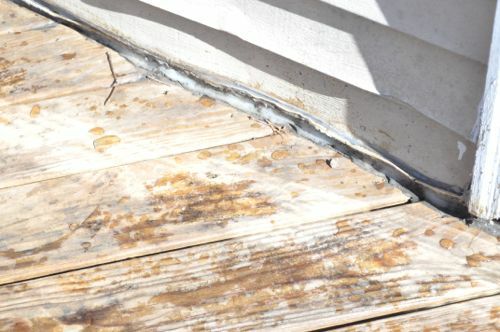 Deck flashing is something that a lot of people mess up and it ends up leaking a lot of water into the house and rotting out the ledger and rim joist. A couple years ago when we were insulating (out-sulating really) and residing our house I shored up the deck and pulled off the ledger. It and the rim joist were so rotted that I could push my nail set right through them.